I read The Hunger Games books a while ago, but when I saw the first film in the series last year, the first book was fresh in my mind. 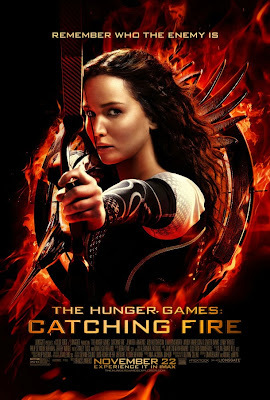 This year, I was able to separate the book from the movie, and I really, really enjoyed Catching Fire - it may even be better than its predecessor. Some may complain that the ending is a cliffhanger, but it adequately prepared us for Mockingjay, the final part of the trilogy, which will come to theaters in two parts in 2014 and 2015. When we last left Katniss Everdeen (Jennifer Lawrence), she had just won the Hunger Games after faking a romance with fellow competitor Peeta Mellark (Josh Hutcherson), allowing both of them to come out of the Games alive. Now, they're back in the poverty-stricken District 12, her hometown, and she's once again taken up hunting with Gale (Liam Hemsworth), her might-be-more-than-a-friend that she's known forever. Katniss and her family, along with Peeta and his, live in the Victors Village, but will be leaving soon for their Victory Tour, in which they spout propaganda about the honor of the Games that President Snow (a deliciously evil Donald Sutherland) is pressuring them to say. But rebellion is brewing in the districts, which Snow wants to quash, and it's Katniss's fault, for the cunning way she and Peeta won the Games. For the Quarter Quell, then - the 75th anniversary of the games - President Snow and his new henchman, the gamesmaker Plutarch Heavensbee (Philip Seymour Hoffman), come up with an evil twist: instead of all boys and girls ages 12-18, the Reaping will only contain the names of former Victors; it's Survivor All-Stars, if you will, only with murder involved. The only three victors from District 12, of course, are Katniss, Peeta, and their mentor, Haymitch (Woody Harrelson), and when Katniss and Haymitch are chosen by Effie Trinket (Elizabeth Banks), Peeta immediately volunteers for him. And so it begins, again, but with tougher opponents and a more deadly arena than ever before. I loved everything about this movie. The acting is spot on and you can tell that the actors who get to play over-the-top roles really have fun with them - Elizabeth Banks as Effie Trinket, with her crazy Capitol outfits, and Stanley Tucci as Caesar Flickerman, a talk show-type interviewer, immediately come to mind. I loved that this installment of the films showed how dark things were getting in the districts; indeed, even the Victors Village in District 12, supposedly the height of luxury, is grim and gray. And I loved that because the films are in 3rd person point-of-view, we get to see more than we do in the books, which are from Katniss's POV (ie, 1st person). Yes, definitely see this film. I would say you don't have to have seen the first Hunger Games to enjoy it, but you should at least go in with some frame of reference as to the events that transpired in the first movie. The ending of this film is definitely a cliffhanger, but it sets up Mockingjay Part 1 nicely, in my opinion, and there's a small twist at the end that some may not see coming; I didn't, because I had not read the books recently. The special effects in the movie are top-notch, as well, especially in the arena and the cinematography of the Capitol. Fans of the books should be pleased with this newest chapter of The Hunger Games, and hopefully fans of the first movie will be drawn closer to this dystopian story with which so many readers initially fell in love. The Hunger Games: Catching Fire is in theaters today, November 22nd, and is rated PG-13 with a runtime of 146 minutes. 5 stars out of 5.